Bristol Harbour is the harbour in the city of Bristol, England. The harbour covers an area of 70 acres (28.3 ha). It has existed since the 13th century but was developed into its current form in the early 19th century by installing lock gates on a tidal stretch of the River Avon in the centre of the city and providing a tidal by-pass for the river. It is often called the Floating Harbour as the water level remains constant and it is not affected by the state of the tide on the river. Netham Lock in east Bristol is the upstream limit of the harbour. Beyond the lock is a junction: on one arm the navigable River Avon continues upstream to Bath, and on the other arm is the tidal River Avon. The first 1 mile (1.6 km) of the floating harbour, downstream from Netham Lock to Totterdown Basin, is an artificial canal known as the Feeder Canal, while the tidal River Avon follows its original route. Downstream of Totterdown Basin, the floating harbour occupies the former natural course of the River Avon, whilst the tidal River Avon flows through an artificial channel known as the New Cut. This separation of the floating harbour and the tidal River Avon allows boats in the harbour to remain floating at low tide, reduces currents and silting and prevents flooding. 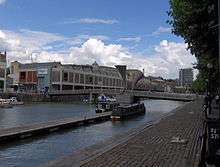 Between Bristol Temple Meads railway station and Hotwells, the harbour and the River Avon run parallel at a distance of no more than 0.65 miles (1.0 km) apart. Downstream of Bristol Temple Meads railway station, the floating harbour meanders through Bristol city centre, Canon's Marsh and Hotwells. At Hotwells, the floating harbour rejoins the tidal River Avon, via a series of locks, and flows into the Avon Gorge. St Augustine's Reach and Pero's Bridge, during the 2004 Harbour Festival. the former Bristol Industrial Museum now M Shed. Bristol Harbour was the original Port of Bristol, but as ships and their cargo have increased in size, it has now largely been replaced by docks at Avonmouth and Portbury. These are located 7 miles (11.3 km) downstream at the mouth of the River Avon. The harbour is now a tourist attraction with museums, galleries, exhibitions, bars and nightclubs. 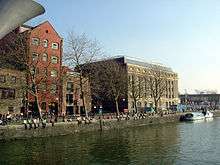 Former workshops and warehouses have now largely been converted or replaced by cultural venues, such as the Arnolfini art gallery, Watershed media and arts centre, M Shed museum, Antlers Gallery and the At-Bristol science exhibition centre, as well as a number of fashionable apartment buildings. The Bristol Harbour Railway, operated by M Shed, runs between the museum and the Create Centre on some weekends and bank holidays. Historic boats are permanently berthed in the harbour. These include Isambard Kingdom Brunel's SS Great Britain, which was the first iron-hulled and propeller-driven ocean liner; and a replica of the Matthew, in which John Cabot sailed to North America in 1497. The historic vessels of M Shed museum, which include the steam tug Mayflower, firefloat Pyronaut and motor tug John King, are periodically operated. Bristol Ferry Boats and Number Seven Boat Trips operate ferry services along the harbour from near Temple Meads station to the Underfall Yard, serving landing stages in the city centre and close to most of the harbour-side attractions. A separate cross-harbour ferry carries pedestrians from the ferry landing at the Great Britain to the new harbour inlet opposite. Bristol Packet Boat Trips offer regular harbour tours with commentaries and river cruises on the Tower Belle up the River Avon to Conham, Hanham and Bath and downstream to Avonmouth. 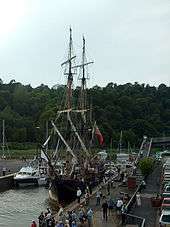 In late July each year, the Bristol Harbour Festival is held, resulting in an influx of boats, including tall ships, Royal Navy vessels and lifeboats. Black and white etching showing the towers of St Stephen's Church, St Augustine the Less Church and Bristol Cathedral, Bristol, UK, published c.1850. The view shows the historic Harbour with 10 sailing ships and rowing boats before the channel was filled in 1892-1938. Bristol grew up on the banks of the Rivers Avon and Frome. Since the 13th century, the rivers have been modified for use as docks including the diversion of the River Frome in the 1240s into an artificial deep channel known as "Saint Augustine's Reach", which flowed into the River Avon. 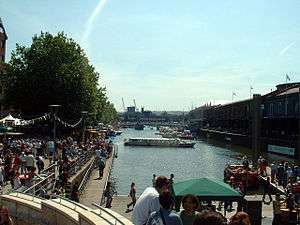 Saint Augustine's Reach became the heart of Bristol's docks with its quays and wharfs. The River Avon within the gorge, and the River Severn into which it flows, has tides which fluctuate about 30 feet (9 m) between high and low water. This means that the river is easily navigable at high-tide but reduced to a muddy channel at low tide in which ships would often run aground. Ships had no option but to be stranded in the harbour for unloading, giving rise to the phrase "shipshape and Bristol fashion" to describe how ships and their secured cargo were capable of taking the strain of repeated strandings on the mud. A tall ship in the Cumberland lock, Hotwells, during the 2004 Harbour Festival. As early as 1420, vessels from Bristol were regularly travelling to Iceland and it is speculated that sailors from Bristol had made landfall in the Americas before Christopher Columbus or John Cabot. After Cabot arrived in Bristol, he proposed a scheme to the king, Henry VII, in which he proposed to reach Asia by sailing west across the north Atlantic. He estimated that this would be shorter and quicker than Columbus' southerly route. The merchants of Bristol, operating under the name of the Society of Merchant Venturers, agreed to support his scheme. They had sponsored probes into the north Atlantic from the early 1480s, looking for possible trading opportunities. In 1552 Edward VI granted a Royal Charter to the Merchant Venturers to manage the port. By 1670, the city had 6,000 tons of shipping, of which half was used for importing tobacco. By the late 17th century and early 18th century, this shipping was also playing a significant role in the slave trade. 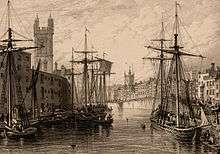 In the 18th century, the docks in Liverpool grew larger and so increased competition with Bristol for the tobacco trade. Coastal trade was also important, with the area called "Welsh Back" concentrating on trows with cargoes from the Slate industry in Wales, stone, timber and coal. The limitations of Bristol's docks were causing problems to business, so in 1802 William Jessop proposed installing a dam and lock at Hotwells to create the harbour. The £530,000 scheme was approved by Parliament, and construction began in May 1804. The scheme included the construction of the Cumberland Basin, a large wide stretch of the harbour in Hotwells where the Quay walls and bollards have listed building status. The tidal new cut was constructed from Netham to Hotwells, with another dam installed at this end of the harbour. The Feeder Canal between Temple Meads and Netham provided a link to the tidal river so that boats could continue upstream to Bath. However, the new scheme required a way to equalise the levels inside and outside the Dock for the passage of vessels to and from the Avon, and bridges to cross the water. Jessop built Cumberland Basin with two entrance locks from the tidal Avon, of width 45 ft (13.7 m) and 35 ft (10.7 m), and a 45 feet (13.7 m) wide junction lock between the Basin and what became known as the Floating Harbour. This arrangement provided flexibility of operation with the Basin being used as a lock when there were large numbers of arrivals and sailings. The harbour was officially opened on 1 May 1809. 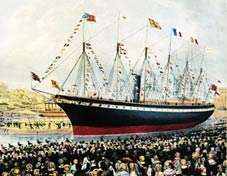 Patterson's yard within the harbour was used for the construction of many ships notably Brunel's SS Great Western in 1838 and the SS Great Britain in 1843. They were some of the largest ships to have been built at the time, and ironically hastened the decline of the city docks by proving the feasibility of large ships. The SS Great Britain was to be towed away from her builders, to have her 1,000 hp engines and interior fitted out on the River Thames, but her 48 ft (14.6 m) beam was too big to pass through the lock. 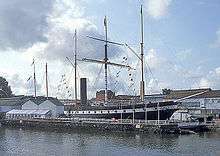 Thus the SS Great Britain was moored in the Floating Harbour until December 1844, before proceeding into Cumberland Basin after coping stones and lock gate platforms were removed from the Junction Lock. At one time there were dozens of Bristol shipyards, the largest in the harbour being Hilhouse, who became Charles Hill & Sons in 1845. The harbour cost more than anticipated and high rates were levied to repay loans, reducing any benefit the new harbour had at drawing companies back from Liverpool. In 1848 the city council bought the docks company to force down the rates. They employed Isambard Kingdom Brunel to make improvements, including new lock gates, a dredger and sluice gates designed to reduce siltation. By 1867, ships were getting larger and the meanders in the river Avon prevented boats over 300 ft (91 m) from reaching the harbour. A scheme to install a much larger lock at Avonmouth to make the entire river a floating harbour, and to straighten the sharper bends, was dropped after work began on the much cheaper docks at Avonmouth and Portishead. The present entrance lock was designed by Thomas Howard and opened in July 1873. This has a width of 62 ft (18.9 m) and is the only entrance lock now in use at the City Docks. From 1893 until 1934 the Clifton Rocks Railway provided an underground funicular railway link from the western end of the harbour, which is close to the locks, into Clifton. 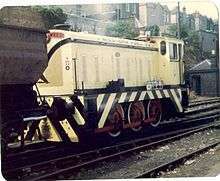 The original Bristol Harbour Railway was a joint venture by the GWR and the Bristol and Exeter Railway, opened in 1872 between Temple Meads and the Floating Harbour. Its route included a tunnel under St Mary Redcliffe church and a steam-powered bascule bridge over the entrance locks at Bathurst Basin. In 1876 the railway was extended by half a mile to Wapping Wharf. In 1906, new branches from the south via the Ashton Avenue swing bridge were built to Canons Marsh on the north side of the Floating Harbour and to Wapping via a line alongside the New Cut. 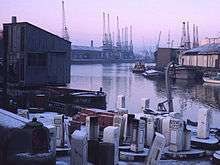 A Coal Concentration Depot owned by Western Fuels was established at Wapping Wharf just behind the Industrial Museum but this closed in 1987. The docks maintenance facility was established on the land exposed by the damming of the river to construct the harbour and remains sited at this location to the present day. William Jessop had created a weir in the dam at Underfall to allow surplus water to flow back into the New Cut, this was known as the 'Overfall'. By the 1830s, the Floating Harbour was suffering from severe silting. Isambard Kingdom Brunel was, however, able to devise a solution to this problem. In place of the Overfall he advised better use of three shallow sluices and one deep scouring sluice between the harbour and the New Cut, together with a dredging vessel. This drag boat would scrape the silt away from the quay walls. When the deep sluice opened at low tide, a powerful undertow sucked the silt into the river to be carried away on the next tide. The shallow sluices enabled adjustment of the dock water level according to weather conditions. Several old buildings, which date from the 1880s, remain at Underfall Yard and have listed building status. The octagonal brick and terracotta chimney of the hydraulic engine house dates from 1888, and is grade II* listed, as is the hydraulic engine house itself. It is built of red brick with a slate roof and contains pumping machinery, installed in 1907 by Fullerton, Hodgart and Barclay of Paisley, which powers the dock's hydraulic system of cranes, bridges and locks. The former pattern-maker's shop and stores date from the same period and are grade II listed, as are the Patent slip and quay walls. A large number of warehouses were built around the harbour for storage and trade. Many survive today and some are being converted into apartment blocks but many have been demolished as part of the regeneration of the area. One which has survived is the A Bond Tobacco Warehouse, which was built in 1905 and was the first of the three brick built bonded warehouses in the Cumberland Basin, and is a grade II listed building. B Bond Warehouse dates from 1908 and was the first in Britain to use Edmond Coignet's reinforced concrete system. It is now used by Bristol City Council and houses Bristol Archives, the Create centre and council offices. Robinson's Warehouse built in 1874 by William Bruce Gingell, and the Granary on Welsh Back are examples of the Bristol Byzantine style with coloured brick and Moorish arches. The Arnolfini art gallery occupies Bush House, a 19th-century Grade II* listed tea warehouse. and the Watershed Media Centre occupies another disused warehouse. In 1908, the Royal Edward Dock was built in Avonmouth and in 1972 the large deep water Royal Portbury Dock was constructed on the opposite side of the mouth of the Avon, making the Bristol City Docks in the floating harbour redundant as a freight dock. In 1977 Charles Hill & Sons, the last shipbuilder at the Albion Yard, closed after delivering the 1541 tonne beer tanker Miranda Guinness. Part of the yard reopened in 1980 when Abels Shipbuilders began operating, who still produce a steady stream of small ferries, survey vessels, tugs and other craft. Amey Roadstone (formerly T R Brown and Holms Sand & Gravel) sand dredgers worked from Poole's Wharf in Hotwells until 1991. Occasionally coastal trading vessels enter the Cumberland Basin to be loaded with large steel silos manufactured by Braby Ltd at their nearby Ashton Gate works. The old Junction Lock swing bridge is powered by water pressure from the Underfall Yard hydraulic engine house at 750 psi (52 bar). The new Plimsoll Bridge, completed in 1965, has a more modern electro-hydraulic system using oil at a pressure of 4,480 psi (309 bar). The Watershed and Pero's Bridge. Since the 1980s, millions of pounds have been spent regenerating the harbourside. In 1999, Pero's footbridge was constructed, linking the At-Bristol exhibition with Bristol tourist attractions. In 2000, the At-Bristol centre opened on semi-derelict land at Canon's Marsh and some of the existing Grade II listed buildings were refurbished and reused. It was funded with £44.3 million from the National Lottery, the Millennium Commission, South West of England Regional Development Agency, and a further £43.4 million from Bristol City Council and commercial partners, including Nestlé. Private investors are also constructing studio apartment buildings. The regeneration of the Canon's Marsh area is expected to cost £240 million. Crest Nicholson were the lead developers, constructing 450 new flats, homes and waterside offices. It is being carried out under the guidance of The Harbourside Sponsors’ Group, which is a partnership between the City Council, key stakeholders, developers, businesses, operators and funders. 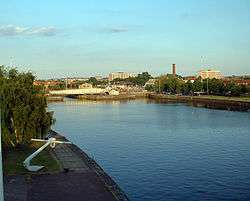 The Cumberland Basin & Baltic Wharf are used by a variety of small boats by Baltic Wharf Sailing Club and is surrounded by tourist attractions. The old hydraulic pumping station has been converted into a public house and is a Grade II listed building. There are three active boat building companies in the harbour: Abels Shipbuilders, Bristol Classic Boat Company and the Slipway Co-operative at the Underfall Yard. Bristol Harbour hosts the Bristol Harbour Festival in July of each year, attended by tall ships and hundreds of ships and boats of all kinds. About 200,000 visitors view the boats, and watch live music, street performances and other entertainments. In 1996, the harbour was the setting for the first International Festival of the Sea. 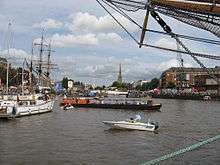 A larger version of the annual harbour festivals, this was attended by many tall ships, including the Eye of the Wind, Pride of Baltimore, Rose, Kaskelot and Earl of Pembroke. The key theme was John Cabot's pioneering voyage of discovery to the Americas and a replica of Cabot's ship, the Matthew, was dedicated prior to its reenactment of Cabot's voyage the following year. In 2009, the 200th anniversary of the Floating Harbour was commemorated with a series of celebratory events. 1 2 3 4 Becket, Derrick (1980). Brunel's Britain. Newton Abbott: David & Charles. ISBN 0-7153-7973-9. ↑ "Welcome to the Bristol Ferry". Bristol Ferry Boat Company. Retrieved 3 January 2011. ↑ "Number Seven Boat Trips – Home Page". numbersevenboattrips.co.uk. Retrieved 3 January 2011. ↑ "Bristol Ferry Timetables and Fares". travelwest.info. Retrieved 8 November 2016. ↑ "Boat Trips in Bristol's Floating Harbour and on the River Avon". Bristol Packet. Retrieved 3 January 2011. ↑ "Bristol Harbour Festival 2011". Bristol Harbour Festival. Retrieved 3 January 2011. ↑ "Picturing the Docks". Responses: Andy Foyle. Retrieved 28 January 2007. ↑ "Ship-shape and Bristol fashion". The phrase finder. Retrieved 25 August 2006. ↑ Wilson, Ian (1996). John Cabot and the Matthew. Tiverton: Redcliffe Press. ISBN 1-900178-20-6. 1 2 3 4 5 Brace, Keith (1996). Portrait of Bristol. London: Robert Hale. ISBN 0-7091-5435-6. ↑ "Bristol harbour history". Tangaroa Bristol. Retrieved 26 May 2007. ↑ "Quay walls and bollards". Images of England. Retrieved 18 August 2006. 1 2 3 4 "The creation of Bristol City docks". Farvis. Archived from the original on 17 May 2006. Retrieved 18 August 2006. ↑ "Underfall Boatyard history". Retrieved 18 August 2006. ↑ "Chimney of hydraulic engine house". Images of England. Retrieved 18 August 2006. ↑ "hydraulic engine house". Images of England. Retrieved 18 August 2006. ↑ "former pattern-maker's shop and stores". Images of England. Retrieved 18 August 2006. ↑ "Patent slip and quay walls". Images of England. Retrieved 18 August 2006. ↑ "A Bond Tobacco Warehouse". Images of England. Retrieved 18 August 2006. ↑ "B Bond Tobacco Warehouse". Images of England. Retrieved 8 September 2007. ↑ "Robinson's Warehouse". Looking at Buildings. Archived from the original on 27 September 2007. Retrieved 19 May 2007. ↑ "The Granary and attached area walls". Images of England. Retrieved 19 May 2007. ↑ "Bush House". Images of England. Retrieved 18 August 2006. ↑ "BRABY MAKE LIGHT WORK OF MAMMOTH SILO DELIVERY". Braby Ltd. Archived from the original on 3 February 2007. Retrieved 28 January 2007. 1 2 "Development areas in Bristol". Bristol City Council. Archived from the original on 30 September 2007. Retrieved 27 May 2007. 1 2 "Bristol – Harbourside Management". Cullinan. Retrieved 22 March 2015. ↑ "New Harbourside development given the green light". BBC News. Retrieved 27 May 2007. ↑ "The Pump House Public House". Images of England. Retrieved 18 August 2006. ↑ "Eye of The Wind – Newsletter". WebRing Inc. Retrieved 31 July 2007. ↑ Staff (1 May 2009). "Bristol harbour reaches 200 years". BBC News. London: BBC. Retrieved 2 July 2011. Wikimedia Commons has media related to Bristol Harbour.